Bharat Patel, a science graduate and a chilli farmer from Kheda district, has reason to cheer. His earnings from the chili crop on three acres of land is set to touch ₹12 lakh this year, which is about three times over what he earned from the same crop last year. Patel is thankful to plasticulture — a technique of using plastics for agricultural applications, which helped him bring down costs and multiply income with higher yields. Patel used a mix of drip irrigation and plastic mulching for the chili crop, which includes capsicum. “Drip irrigation led to a bumper crop despite limited water availability. The plant grows faster and healthier. Last year my net profit was around ₹4.5 lakh, but this year, on a conservative estimate, we expect to touch ₹12 lakh with same area and crop,” he says. Mulching helps retain soil moisture for a longer time. Drip irrigation costs ₹60,000 per hectare, while mulching costs ₹32,000 per hectare. The Centre provides a subsidy of 60 per cent and 50 per cent respectively on the costs for adopting these methods. According to farmers, taking out the costs, farmers benefit in the range of ₹40,000-50,000 per hectare. Sagunaben Patel, a nursery owner in Petlad of Anand district, has expanded her plantation by nearly three times with the use of plasticulture. She took training in advanced plasticulture crop cultivation techniques at Reliance Industries Limited (RIL)’s Plasticulture Development Centre near Vadodara and learnt techniques of shade net and plastic tunnels besides drip irrigation and sprinkler systems. “I am growing more saplings now and the yield has doubled,” says Sagunaben. Farmers in parts of Gujarat are increasingly turning towards plasticulture in the form of pond lining, drip irrigation, sprinkler irrigation, mulching, greenhouses among others, to cut use of water by 40 per cent and fertilisers by 30-40 per cent besides reducing electricity consumption. The techniques, propagated during the State government’s Krishi Mahotsav, are popular for crops such as spices, vegetables and cash crops such as banana, cotton, groundnut and castor. “The technique of plastic mulching reduces weeds and pest attacks in cotton. Weed management helped halve use of insecticides and increased yield. Our costs have gone down and profits have increased,” said Hitesh Patel, a cotton grower in Wadhwan, Surendranagar district. 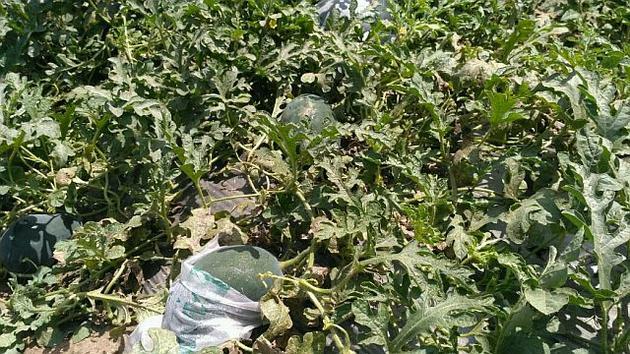 Farmers growing other cash crops such as banana and watermelon have started using fruit cover, and PP non-woven fabric to keep fruit safe from insects and weather extremities. According to scientists at RIL’s Plasticulture Development Centre, India has very negligible plasticulture usage. As against the global average of 32 kg per capita per annum, plastic consumption in agriculture in India hardly reaches around 1 kg, while that of the United States is about 100 kg. In order to encourage farmers to take up modern techniques in the farming and conserve natural resources, PDC works with States and central government agencies to help farmers avail subsidies. RIL has been working with 22 States to promote use of plastics in agriculture. The correspondent was in Vadodara at the invitation of RIL Plasticulture Development Centre. The writer of the article is Rutam Vora.